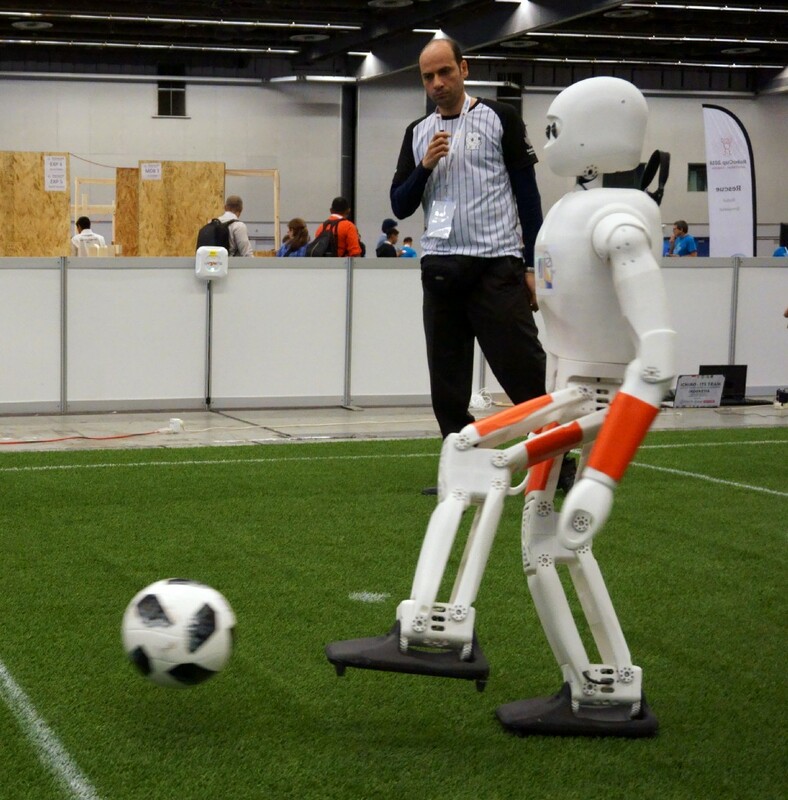 It’s not often you see a robot designed specifically for playing sports, but that’s precisely why the RoboCup Federation was founded- to allow robots to play in an annual soccer (or football) competition using official FIFA rules in an effort to promote robotics and AI research. The winner of this year’s RoboCup competition (held in Montreal back in June) for the Adult Size League went to the University of Bonn Autonomous Intelligent Systems’ new NimbRo-OP2X robot, which beat the University of Applied Sciences’ Sweaty II humanoid robot. According to AIS, NimbRo-OP2X is a fully open source platform that stands 4.42-feet and weighs 19.8 pounds. Its low weight is due to the fact that the robot is almost entirely designed using 3D-printed parts — including its modular frame and the gears driven by its 34 Dynamixel-X series actuators that are used to move the robot’s 18 joints. The NimbRo-OP2X is outfitted with a Logitech C905 camera that identifies obstacles, ball orientation, and goal positioned using computer vision, parallel computing, and ROS, which is processed by an onboard Intel i7–5500U-based ITX PC. The ITX board communicates with a Robotis CM730 sub-controller board that drives the robot’s actuators, which are all connected to a single Dynamixel bus. Power is provided by a pair of DC 4-cell Lithium Polymer battery that provides roughly 40-minutes of game time before needing a recharge. NimbRo-OP2X Is an Adult-Sized, 3D-Printed, Soccer-Playing Robot was originally published in Hackster Blog on Medium, where people are continuing the conversation by highlighting and responding to this story.